Dental care is a very important part of your pet's health and well being. Patients that receive regular dental prevention (including brushing, oral rinses, and regular professional dental cleanings) on average live 30% longer than their counterparts who do not. If you notice an strong odor from your pet's mouth it may be time to have your pet's teeth evaluated. This picture demonstrates a patient in need of a professional cleaning. Our doctors and technicians have extensive training in both basic and advanced dental care. Because both dogs and cats will not allow us to complete a thorough dental cleaning and examination while awake, it is necessary to put them under general anesthesia during the procedure. All patients are anesthetized and an endotracheal tube (a plastic tube designed to allow us to monitor your pet's breathing at all times as well as protect your pet's airway from tartar debris and water from the cleaning) is placed in your pet's trachea. Tartar is scaled from the teeth using an ultrasonic scaler. To get beneath the gum line, a subgingival tip is used to clean away tartar that would otherwise not be visible. 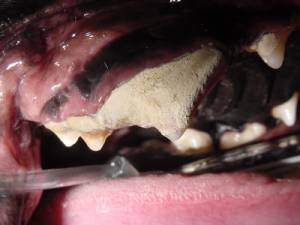 The teeth are then probed to see if there is pocketing around the teeth. Pocketing is a process where the gums separate from the tooth and allow food debris and bacteria to collect under the gum line. This can lead to abscess of bacteria under the tooth and eventual need for extraction of the tooth. The same patient after the dental cleaning. 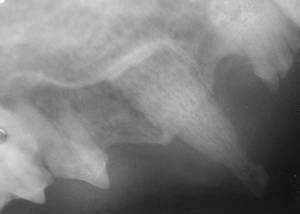 Next, radiographs are taken of the mouth to determine if there is disease between the teeth and the underlying bone. Many times we are unable to decipher if a more extensive problem is present and this is an ideal way for easy identification. If a problem is present, periodontal procedures can be performed to alleviate the underlying disease. Procedures, which can be offered for problematic teeth, include: root canals, dental fillings, root planning, tooth extractions, gingivectomy, pulpotomy, periodontal implants, and more. 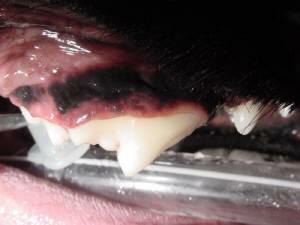 Also, a sealant can be applied to your pets teeth to help prevent future tartar accumulation. Please feel free to ask about other dental preventive products that are available for purchase.